Question: Do these plans include the material type, size or rating required to build and have the plans approved by the building department? Answer: Our plans are standard home plans. There are certain materials called out. However, it is incumbent on the builder/owner to determine the specifics of these materials. Certain things are understood. For example, most studs are spruce as well as top and bottom plates. However, things such as carpet are not called out. One may wish to have carpet in certain rooms and hardwood in others. Those choices are made by the builder/owner. The plan is constructed using standard building practices and materials. The plan will have to be approved locally by the building department and/or other similar agency if applicable. Although these plans are prepared with the 2006 International Residential Codes in mind, there may be local issues that will supersede said codes. 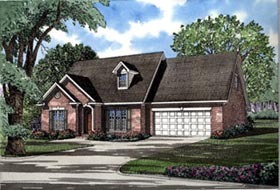 This plan is a stock home plan and is generic in that it is not site or location specific. This plan may be sold in numerous localities and what applies in one location may not be applicable to another. If one is dealing with a local building authority then one has to answer to that authority and will have to have this plan approved by them before proceeding with construction if that is what local regulations dictate.